We were impressive: A whole cavalcade of motorcycles. Or perhaps not so impressive. On the back roads of the United States, where we just came from, we would be ridiculous. The motorcycles were little Yamaha 100s, tough machines, but not the American bull-machines that roar through upstate summers. Each of our motorcycles was stacked high with baggage and supplies, and each motorcycle carried two people: driver and passenger, sandwiched together. For Rebekah and particularly Jojo this was a big event: Back to Epulu, and John joining us in a week and a half. But it was the uncertainty of the times that put an edge on everything. This was my third trip to Epulu this year, all on motorcycle; the vehicles had been the first things looted back in 1996 and it still wasn’t safe to replace them. Only two of these motorcycles were ours, the other two rented in Bunia. Jojo’s un-self-conscious excitement was obvious. She continually turned to wave at me…perhaps to make sure I was behind her. Thumbs up, she held both fists high. Thumbs up, I signaled back. There, on that narrow dirt track, the main road heading west from Bunia, any vehicle was now uncommon and to have four motorcycles accelerating together was noteworthy. To have white people on the backs of three was remarkable; that those three were female and two quite young was astonishing. The few pedestrians, who were able to verify such details as we sped by, stood mouth agape or, if young enough, they jumped up and down shouting and waving. It was only 6:30 AM, the observers were mainly standing in front of their own mud and wattle homes. We were with Robert Mwinyihali whose half-smile and lanky slow shrug managed to point out the humor in every situation. On the back of the small motorbike his bent knees were high like a grasshopper’s. Robert had been managing Epulu’s research and training center before the war, and now continued stoically despite frequent visits by needy military of unclear allegiance. Anything legitimate that continued to operate did so with stoicism. Our drivers were Tomo and Kabukaye from Epulu and two young fellows who came with the rented motorbikes from Bunia. The early sun rediscovered this world along with us, shadows dissolved along savanna swells. From a low crest, grass domes of Hema cattle-herders dotted more distant crests. Then the road dove into a patch of sweet potatoes and beans, and through a cluster of Bila houses where women swept courtyards. 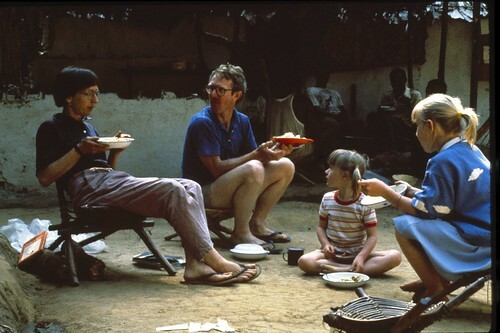 Although John and I came to Congo several times a year since 1996, it was just the two of us or each alone. The family, would come only when conditions were better, but now we wondered if any lasting peace was likely before our girls were all too old to accompany us. This was Bekah’s first trip since the war of 1996. Jojo, had come once before. At that time we rented an old box with 4-wheel drive and a cracked windshield that coughed fumes into the cabin at the same rate as out back. There had been a brief political calm, when we thought the country would start to rebuild. John and I came in with Jojo and Sarah who had taken off from college to be Jojo’s tutor. It was a lovely few months, but we had barely left when war broke out again. Mobutu was overthrown in the first war and the rebel leader, Laurent Kabila, assumed command. During the second war, starting in 1998, Uganda and Rwanda, displeased with Kabila’s grasp on power, took over the eastern half of the Congo. Other neighboring nations supported either Kabila or the east. Now the newspapers talked of a divided Congo with wars along the frontlines west of Epulu. But in reality there was no peace anywhere. Warlords ruled small fiefdoms and vied for the support of foreign powers. Retrospective – Eating beans and rice at Afarama. John, Sarah, Rebekah and me in 1988. On this trip, Sarah stayed in America with a between-semester job. A short trip, it was Jojo’s and Bekah’s summer vacation. John and I both felt they should come now because there was no certainty that there would be a better period anytime in the near future. Without telling them, we figured this was their good-bye; Epulu would never be home again. The shadows diminished as the sun climbed. Family groups appeared more frequently, on their way to the fields. A pregnant mother carried an empty basket on her back, hoe balanced on her head over tump line. Her young daughter, with the baby strapped to her back, followed closely, two steps to each of her mother’s. Up ahead the father and son strode along with machetes and hoes. Jojo waved vigorously. “Ohh eii” the son waved back with a spirited leap to the top of a termite mound to see better. Even more enthusiastic were the two young Hema boys whose cattle were plodding along the road. The motorcycles slowed, finding their way between the cattle that glanced slowly sideways, still brown eyes slow to react. The boys ran along beside them, swinging their staves, herding the cattle to one side and shouting their greetings simultaneously. “Aaaiii, maaooo” . Jojo waved both hands and the boys waved back, each holding the stave out parallel to the ground but free hand gesticulating vigorously, half–clad imitations of traffic cops at a busy intersection. The savanna, as always, had a nostalgic familiarity but there was a new foreboding in its green vastness. This was a part of the savanna arc through Rwanda and Burundi that stretched over the hills north of Bunia. Pastoral tribes and agricultural tribes inhabited the same land in an uneasy truce that turned turbulent as populations outgrew their shared use of land. There had just been bloody wars in Rwanda between Tutsi and Hutu. In Congo, warlords representing one tribe or another gained temporary political ascendancy, never successfully representing more than one of the rival tribal groups – Bila, Hema, Geti, Lendu. While in Bunia, the girls and I stopped to see Hannah and Kahiigwa who now had a second house in the city because of tenuous security in Nyankunde. 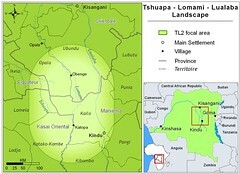 Kahiigwa, as a locally prominent Hema, was likely to be targeted by militias from the Geti agricultural group. The missionaries, themselves, had all left Nyankunde in 1996, and the hospital was often without supplies or medical staff. We found Hannah in Bunia, although Kahiigwa had gone to Nyankunde for a couple of weeks. She was sitting in the outside kitchen and saw us walk up from their gate under the arching Bouganvillea and past the ruminating goats, secured by a long rope. She started up. “Aie, oh mama,” Hannah hugged me, laughing, and held both girls at arms length before hugging them. It had been so long since we had seen each other and even longer since she had seen the girls. It had been from well before the war. Since the war I usually came in through the forest town of Beni, which was a bit closer to Epulu. Although Beni and Bunia now both gave allegiance to Uganda, internal divisions were rife. Recently they had intensified and I feared that we might be detained and fined in Beni. There was an incipient national administration in Beni just as in Bunia. Epulu was aligned with Bunia, thus the Bunia route, Robert had advised us, was likely to be more secure. 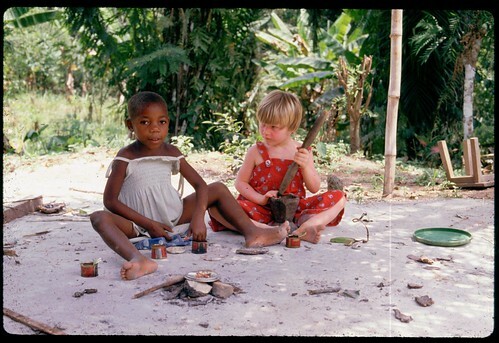 Retrospective – Musiliangi painting Bekah with Kange – 1989. Hannah insisted we come to dinner that night. During the afternoon she took Bekah and Jojo to the hospital to see Hannah’s grandchild who was recovering from pneumonia. “Mom,” Bekah told me afterward, “they did not use sterile technique at all. Right in front of us, they used the same needle on two people without even washing it.” At dinner that night Hannah laughingly told me how Bekah had made the nurse take some dirty bandages from the ward and had insisted that they wash up an end table where they dressed wounds. She explained how the lack of missionary doctors also meant a lack of funds and a lack of morale. “Bekah will come back and be a doctor,” she said confidently. 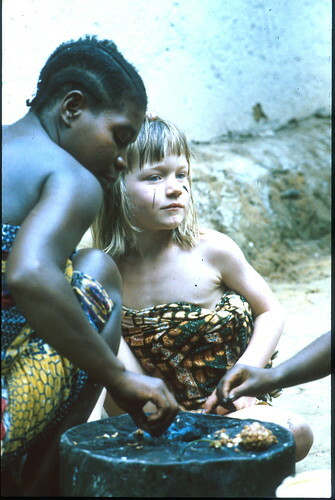 Bekah had not forgotten any of her Swahili and could speak confidently with Hannah. Jojo constantly pulled me over. “What did they just say?” she asked. Hannah regretted John’s absence. She remembered the hilarity of evenings long ago when he recounted his misadventures in great detail. Bekah explained that he was working in West Africa but would come in through Beni in two weeks. “Ehhh, why not Bunia?” As Hannah walked us back to the house we were renting for two nights, we promised that we would all stop to see them when we left through Bunia in August. In the dusk the deterioration of Bunia was not quite so obvious. By day grand old colonial houses, once neatly tended as missionary homes, were disgraced as barracks or divided tenements. Many of the large pane-less windows were boarded up with only a small hole left to the daylight. Roof tiles were missing and front steps were eroded, separated from the entry path by a deep outwash gully. Gardens and lawns were trampled into nonexistence. Hannah had lived among missionaries most of her life; she knew their departure meant neglect. But for her the real deterioration came from the loss of training and professionals, the loss of contact with an outside world. “Remember you are going to come back as a doctor,” she said with a confident smile to Bekah. Bekah was just five years younger than I had been as a Peace Corps teacher. We hugged our farewells. As the sun shone more insistently on the road, I checked to make sure that Bekah, way ahead, had her head covered, that there was no blond hair flying in the wind. I hoped that she had remembered to pack the sunscreen where she could easily reach it. Were they both remembering what I had said about sitting up straight, relaxing, occasionally stretching out their legs? Jojo looked back and raised her fist. I raised mine in response. Thumbs up. Retrospective – Sofi with Jojo at Palais. Leaf on Jojo’s forehead for “luck”. A few kilometers before the Nyankunde turnoff, the motos ahead of us stopped. When Jojo and I came up, Robert was talking with Tomo, Bekah’s driver, and a third man standing by the road. The man had a dilapidated Suzuki. He worked for MedAir, an international humanitarian group. They were speaking in a combination of French and Lingala, but Bekah and I picked up the tenor of the discussion. There had been trouble on the road ahead. Shots. A battle. I felt a sudden wash of anxiety, but mastered it. We decided that we would wait for more information. It felt good to get off the motos. Robert pointed off the road where there was a mud-walled church and a few houses. Tomo, Kabukaye, and the other drivers started to push their motos in that direction. The Suzuki chauffeur stayed by Robert. “I can’t risk losing the vehicle,” he eventually said; he turned the Suzuki around and drove back towards Bunia. The girls and I followed the motorcycles up the incline. For a half hour we sat on benches in the back of the church. The entire community, at least all the women and children, had taken off down paths into the long grass, so as not to be close by when soldiers came through. One last girl, maybe about fifteen, untied some goats to take with her. She showed me the beginning of a path over the savanna. Best to know. And she showed us where the outhouse was. I took Jojo. And then we waited. Eventually Tomo and Kabukaye went back down to the road where Robert and a few of the men from the village were standing. Still no word. We could continue to wait. We could turn back. We could go on. Robert looked at me. My decision. If we turned back, we might end up waiting for days in Bunia and always with very little information. There had been no more shots and no word of further fighting. Besides, if Robert left the decision to me that meant he thought we could go on. “Tuende. Lets go,” I said. Bekah and Jojo were more than ready. Bekah swung on the back of Tomo’s moto. She was fair and enough of a woman to make Tomo more of a daredevil than quite appropriate for a driver under the circumstances. Jojo, shorter, with brown hair, freckles, and pre-adolescent slenderness leaped on the back of her moto. She wanted to show that no one had to wait for her. We all put on our sunglasses and I helped Jo rearrange the scarf over her hat. A few kilometers further on Robert stopped to talk to some boys on the roadside. When we came up, I realized they were soldiers. Three of the four had partial uniforms: two with khaki pants, one with an unbuttoned khaki shirt. Two of the four would be called kadogos, boy soldiers, younger than Bekah. All this was clear in a glance. Robert was talking to the oldest, probably about twenty-five. Then I realized that he was wounded. His arm hung limp at his side and flies were buzzing around a damp stain on his shoulder and down his shirt. He was very animated. Perhaps in shock. The fighting had been around Nyankunde, at dawn. No, there had been no fighting since. He was a soldier for the president Wamba dia Wamba, but the troops at Komanda farther west were with Tibasima (a new leader). “So you must not go on. Do not continue.” He spoke mainly in Swahili, peppered with French, an indication that he had had some schooling, maybe even a year or two of secondary school. “Tibasima’s troops are undisciplined. They will be coming down the road. Certainly they will fire on you. You should turn back. Robert sat back on his motorbike. He was very tall and commanded respect. “You are heading back to Bunia?” he asked. “Ndyio. Sasa hivi. Right now.” The soldier signaled to his companions who started down the road the way from which we had come. Two had on plastic sandals, one was barefoot, all were armed. Several more kadogo materialized from behind a building across the road. They followed the others. They too were armed. “What is the likelihood that soldier knows what he is talking about?” I asked. “Hajui kitu. He doesn’t know anything,” Tomo volunteered. I hesitated. “Well why don’t we go on a bit and see what we see. We can always turn back later.” That seemed to be what everyone wanted to do, so we continued. I wondered how Kahiigwe had fared in Nyankunde. An image of the intensive care unit briefly came to mind. I saw it empty, with the beds tipped helter-skelter against the wall and mattresses on the floor. The road was quiet. The sun rose towards its noon-time intensity. Soon we were passing people carrying viazi (sweet potatoes) and bunga (manioc flour) to the market in Irumu. We passed several men on bicycles loaded high with leaf tobacco. Jojo waved to the right and then to the left. Women stepped back from the dust steadying their load with one hand and waving to Jo with the other. Jojo turned towards me. Thumbs up. I could imagine her eyes shining, though only a slit of sunglasses were visible between head scarf and scarf covering her nose and mouth. 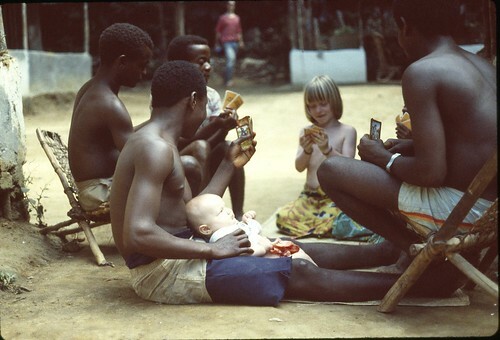 Retrospective – Bekah playing cards with the team at Afarama. Jojo is passive observer – 1989. Several kilometers outside of Komanda, Robert’s moto had a flat tire. Tomo and Bekah stopped. Tomo had the tools for fixing it. We came up just as Bekah had shaken out her hair and wiped her face with a kerchief. The dust showed up dark on her fair skin just as it showed up as a light frost on Robert’s dark skin. Robert waved us on. “Find a place to sit and wait for us in Komanda. This will only take a few minutes.” Bekah was smiling, confident. She was heading toward the shade of a tree where a young girl holding a baby, probably her little sister or brother, was watching with open curiosity. Bekah would be fine. We waved at Bekah and continued. Perhaps we’d be able to get a coca or fanta-orange, the most common softdrinks. I felt the excitement of approaching forest. There was an extensive gallery forest just in the valley on our left. I was eager to move on. Several military stood in the middle of the road just outside of Komanda. My moto came up just after Jojo’s, whose driver, Beaudouin, one of the fellows from Bunia, was cowering, too nervous to speak. The military barred his way and seemed angry. They turned to me. “Where you coming from?” they barked in a simple French. “Bunia,” I answered. “What is going on down the road?” So they knew that something was going on. “There was trouble at Nyankunde,” I said. They looked at each other and several kadogos came over from the side of the road. “The trouble was early this morning,” I said, “it was quiet when we went by.” The main soldier, the one blocking our way grunted. “Where are you going? “ “Epulu,” I answered, “we work for the Parks.” He seemed satisfied, preoccupied. He looked over our loads but did not ask us to take them apart. He waved us on. When we passed through Komanda a month later on our return to Bunia, there was a new Ugandan commander and all the troops that were there previously had disappeared, with their guns, into the forest. They joined the growing ranks of the armed but non-aligned soldiers. Perhaps they had joined the Mayimayi, the name given to the most organized of the independent militias, living off poaching, ivory, and gold smuggling. A half hour later, Robert and Bekah drove up to the rough-hewn outdoor table where we waited. We all had something to drink, but there was no functioning restaurant. We bought some roasted peanuts from a boy in ragged shorts and then we continued. Soon the road narrowed through forest. Savanna dust was replaced by mud holes. And between mudholes there was more mud. It was easier for a motorbike than a vehicle, but even so we walked around many holes and often it took two or three of us to push a motorcycle through a slurry. By three o’clock we were passing Lolwa. Shadows were already long by the time we approached the town of Mambasa. We would have to spend the night. There were just two possible places to stay. On the west of town was Mandima, the Protestant mission, and in the center of Mambasa was the Catholic mission. Both were as old as Mambasa itself. 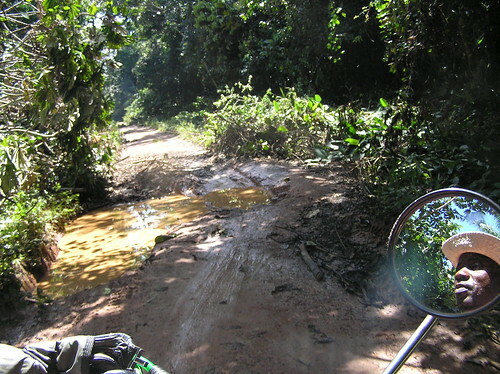 Passengers walk as motorbikes make there way around a forest mud hole. I imagined that Mandima was empty. Protestant missionaries took their families out of danger zones; the successors to the Dortayes had been another Swiss family. Protestant missionaries also maintain strong personal relations with their home church, which would have whisked them away. I told Kabukaye to pause at the top of the hill where a road turns off to the mission. I signaled Jojo’s moto to stop as well. We gazed over the steel roofed buildings, poignantly familiar to me although only a curiosity for Jojo. The rooves glinted in the soft sun of late afternoon. There was the guest house where we had stayed long ago. And the clinic. And the path back to the airstrip. A man walked over from a small group strolling up from the mission. “Kisezo!” We shook hands enthusiastically. “Are you still working at the hospital here?” “No, I am based in Nyankunde. I work with MedAir and we are here on a vaccination program. We will only stay a couple more days.” Kisezo paused, “Did you have trouble getting around Nyankunde this morning?” So he had heard too. I told him that it had been quiet when we went by. He was looking at Jojo. “I am here with Rebekah and Jojo,” I said “Rebekah has continued ahead though.” I regretted. I could tell that Kisezo hoped to see her. Her recovery was still thought of as miraculous among missionaries and their medical personnel. “Marianne and Yvonne came with me,” he continued. “Yvonne lives in Switzerland now but came for two months.” It would be so good to see Yvonne. Not only had Yvonne been Bekah’s nurse when she was in the intensive care ward at Nyankunde, but she was also the midwife who had delivered Jojo. “She’s in the Dortayes’ house. That is the only house that still has any furniture.” We turned down the mission drive. When he saw us, the zamu took off at a shuffling run to inform the dema–zelles. Yvonne was just as I remembered her: Penetrating brown eyes over a kind smile, organized and neat. White hair in place, pressed African cloth jumper and sturdy shoes. “Térèse,” she said simply as she took the hand I held out in both of hers. Then she turned to Jojo and took her hand looking questioningly at me. “Eléanore Joanne. You delivered her ten years ago in Lolwa.” “Ahhh.” Yvonne turned back to Jojo without relinquishing her hand. “I — very glad — see you,” she said in broken English. Jojo smiled. Shy. A little at a loss. I shook hands with Marianne who had also come out the door. We did not say much. They were so sorry there were no more beds. I told them I had to follow Rebekah and Robert anyway. They told us about Nyankunde. One soldier had been killed. Several were injured. They had gotten the information over the two-way radio in the MedAir vehicle they had come in. They would return to Nyankunde in two days. Robert spent the night with friends in Mambasa. After he left, Père Henri hustled up the cook and told him to find spaghetti to make the littlest demoiselle happy. He showed us a back room with two beds that the girls and I shared, leaving our mud caked clothes outside the door. We were up by 6:00 AM. Before the drivers appeared, Bekah was back in the clothes stiff with half-dry mud. Jojo hesitated. She had soft clean pants in her bag. Why couldn’t she wear them? We convinced her that a half-hour down the road they too would be caked with mud and in the meantime we would have to pack the muddy clothes in her bag. With a sigh she pulled on the harsh cotton and denim. But Jojo’s spirits were high by the time I had had my coffee with Père Henri and she had given her fond farewells to Muchafu who purred a loud refrain in exchange for attentive scratching and morsels of Père Henri’s Gouda cheese. Forty-five minutes later we entered the Reserve, Réserve de Faune à Okapi. There had been a barrier at the entrance, not now. The pole across the road had assured the park guards’ right to check loads going in and out of the Reserve. Set up when the Reserve was declared in 1992, John and I felt the barrier symbolized a first step towards protection of the forest against the immigration and agricultural expansion foretold in Tom Struhsaker’s warnings. Now it was clear protection would take more than wooden poles and state decrees. At least, the guard-houses were still at the entrance to the Reserve. Guards and their wives surrounded us at the barazza. There was Sira and Pierre and Bogumba. All in uniform. We were able to replace the uniforms after they were confiscated during the first rebellion, but not the guards’ rifles, also confiscated by the rebel armies. “We were expecting you,” Sira said. “Kasambaka, ahh, you are a woman,” Pierre laughed, sizing Bekah up. “Kasambaka Kenge.” Pierre and Sira had both been at the Station when we first arrived in 1981. “You must be growing very old, mamaTérèsi,” he commiserated with a twinkle in his eye. We did not stay long. It was another two hours of bad road to get to Epulu. But now we were recognized in every village. “Kasambaka, Kasambaka” was a frequent refrain, but often the motos with Bekah and Robert were well ahead of Jojo and me. A couple times we passed Bekah and her driver, Tomo, stopped at a village. Later Bekah told me that Tomo was telling her where her friends were. Many had dispersed. They stopped at Koki to inquire about Amafoliki. Bekah had slipped off the motorbike at the Mbuti camp just past the village to look for her. “She has two kids, Mom,” Bekah later told me, adding, “But at least she has a man.” That was more than many of the new mothers from within Bekah’s circle of friends. It was noon when we arrived in Epulu. The sun had the concentrated ferocity of the rainy season when constantly galled by sudden storms. We crossed the river and stopped at the capture station, now Reserve headquarters, to greet the warden and guards. Once off the moving motos the sunlight was staggering. We did not stay long, just long enough to get the flavor of the news. I commented that the barrier was still not operational. Events in Epulu were similar to those at the guard post. The warden told of poaching that was now threatening the edges of our study camps and elephant meat being sold in town. Despite the grim news, it was delightful to be back in Epulu. We were eager to get to Palais. “It’s good to be here,” I called to the warden as Kabukaye revved the motor and I remounted behind him. We sped up to the top of the Epulu hill. The hotels and restaurants were all closed. There was no traffic on the road except the bicyclists who preferred cheaper roadside food, a leaf-wrapped manioc “stick” with peanuts. Several of the little stores had closed, and even those that remained open, their shelves, seen through the sagging open doors, were half empty. The village was even more destitute than when I had last been here several months earlier. As we stopped in front of Bosco’s abandoned restaurant I explained to Bekah that he was dead. Bosco had been ill for a month, but died just one day before Mobutu’s fleeing soldiers swarmed into Epulu . Bekah had already seen enough to say that maybe it was just as well, why should Bosco see everything he had built be trashed when he, himself, had no longer the energy to rebuild. Dudu ran out to greet us, as did Muzama and Kavira’s sister Maseka. “Ah ah ah. Kasambaka is a woman. Ah ah ah.” Dudu clapped her hands together and shook her head. She had no shame about eyeing Bekah up and down in all her muddy nubile glory. Bekah laughed. “Go ahead and tell me I’m an old lady.” Tomo assumed a pose of tolerant responsibility, as though, as driver he had personally decided to bring Bekah and now was permitting these conversations. Dudu held Jojo’s arm over her head. “OOO lé, this one has gotten big like a rat in salt fish.” Jojo did not quite understand, but smiled as though she did. We did not pause more than five minutes in town. We turned and continued down palais path, waving as people called from their houses and stood up at their barazzas. I raised two hands as Azama called “Ohh Mama” sending a scattering of peanut shells to the ground as she half stood, laughing, a grandchild grasped with one arm and another eating peanuts by her knee. But we didn’t stop until, beyond the last houses and kitchen gardens, under Putnam’s avocados in the little uncut extension of the huge downstream forest, we came to Kenge’s camp. There we stopped. It was shaded, cool, and very quiet. There were people sitting around: Abeli was there on a stool by his house and Anjiani, Tshukiza’s mother, was peeling plantains by a fire, and there behind the fire, on a mat laid on the ground, shoulders slumped, head sunk, sat Kenge. Anjiani and Abeli stood up and Kole’s wife, holding a baby, ran over. I walked over to Kenge and took his hand. “Pole,” I said, “I’m sorry”. He looked up, a smile washed over the drawn face. He was about to talk. But both Anjiani and Abeli came over and Kenge returned to his slump. “Kole is in Lenda,” (one of the study camps) his wife told me when I asked after him, “Atoka is out with papa Paulin. They will be back tomorrow.” Paulin Tshikaya was in charge of the Research Center’s elephant monitoring team. A little group formed around Jojo and me; Abeli was beaming, Anjiani, dressed only in a loose loin cloth, said to send some salt, she needed salt. Marie ran up, half dancing and exclaiming over Bekah and Jojo. Bekah was already off her moto and striding back to where she saw Atoka’s daughter, Yambabo, sitting in front of an endu with a baby on her lap. Jojo stood very close to me. She did not want to seem overwhelmed “John will come later, “ I said , “He is on his way now.” Suddenly Sofi ran up. “Mama, mama.” She was half wailing, half shouting in delight. She grabbed Jojo’s two arms, Jojo who was a whole head taller than she was. “Won’t you stop growing? How am I going to pick you up any more?” Then she turned and started running down the path. “I am going to put on tea water.” I took that as our signal. Jo and I climbed on the back of our motos for the final ride down palais path. Bekah would follow later. The next few days I spent mornings and afternoons with the staff of the Research Center John and I built before the war. Together with the warden from the station we started to build a plan. Elephant poaching and illegal mining: those were the problems. Sometimes we were around the table at palais, sometimes we were in the warden’s office, but often we were at the Research Center. It was the most private. The Center’s row of small houses was masked by trees on the opposite side of the Epulu River from the village. There was also an office and two four-bedroom dormitories. We gathered in the central room of one of the dormitories. The research staff continued gathering information through the turmoil. They traveled all around the Reserve but, having no history of enforcement, were not viewed with the same suspicion as park guards. Richard Tshombe and Robert, in charge of a zoning project along the road saw how illicit buyers of ivory and particularly of gold or “coltan” ore spread through the reserve. Innocent Liengola who led a monthly study of fruiting and flowering on the study areas, saw how small mining camps sprang up in remote forest. Paulin, with his elephant census throughout the forest, learned who the major poachers were and their bases of operations. 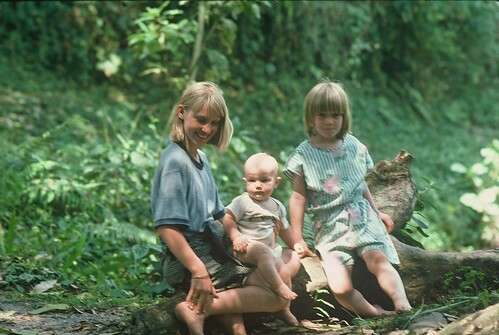 Retrospective – Sarah, Bekah and Jojo at Afarama, our forest camp – 1990. The only way to combat poachers was to have the military work with us; this was complicated as some military were implicated in the poaching. John and I could be most helpful by reaching an international audience. By mobilizing international NGOs to take a stand, our own, Wildlife Conservation Society, and others such as Gilman International Conservation, that helped support the station. Our discussion group at the Research Center decided Ugandan leaders had to be informed that Ugandan soldiers were among the poachers that information would reach international media. Hopefully pressure from above would give us the backing needed to pull together a strong anti-poaching force. The days were spent interviewing informants, drawing rough maps with Paulin, writing and translating text to English so the Ugandans could read it. We dubbed our plan to clean out poachers “operation verte”. We had to get permission from rebel authorities for the guards to keep all guns that were confiscated. It was essential. What good was Paulin’s elephant census if we could not protect the elephants? What good was the zoning project if the zones were not respected? It was essential that operation verte be a success. 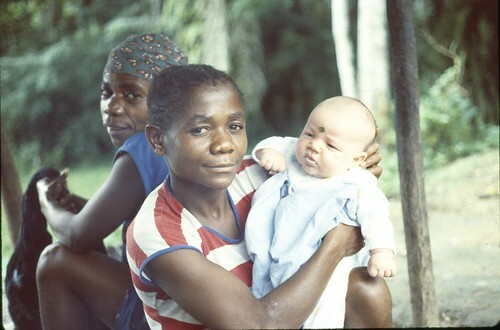 At first Bekah took charge of Jojo, taking her up to town to visit Dudu and over to the Research Center to visit the wives of Innocent, Paulin and Robert. They spent afternoons in camp hearing the news, but Jojo quickly found previous friends and new ones. There was Shingonzi, Atoka’s younger daughter, and Katina. 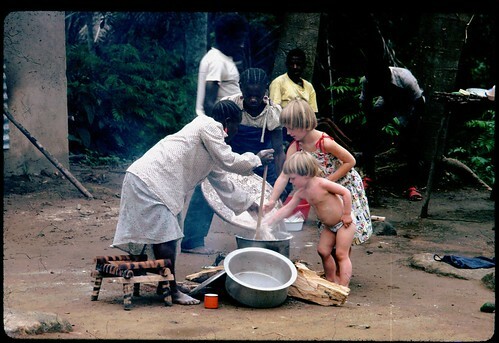 Sometimes they took care of Kole’s baby while the women were at the Nepuse stream washing clothes or off picking sombe. But when joined by the boys, Sokolo, Yenga, and Papi, they quickly assembled an arsenal of ingenious model AK-47’s made from raffia palm and ndolo stalks. Each had his own gun and ammunition holster, they would disappear around corners and then creep forth looking in all directions, or burst forth shooting. They ended in a laughing knot around the kitchen fire. Jojo adopted her gun with no hesitancy at all, and she joined her team, swirled around Sofi, and disappeared somewhere behind the food depot. Sofi scratched her head, raised her eyebrows and returned to pounding the sombe. It was nice to be with the two of them, Bekah and Jojo, at the end of the day. The abundant supplies of garage-sale baby clothes sent by my mother were almost gone. Most of Bekah’s former playmates now had a new baby or were expecting one. These changes did not estrange her from her friends; nor did she bemoan their fate. There had always been infants in their games even when they, themselves, were merely nine and ten years old. Perhaps this made early womanhood easy to slip into, perhaps there just weren’t many alternatives. Bekah accepted her own long adolescence with hardly a shrug. She did tell me though of one friend, Mado: “Mom, she has no children and no bwana (man). She is caring for her mom who has been sick for a long time and taking care of all her brothers and sisters.” Bekah appreciated and admired her sacrifice. She would take Mado little gifts of sugar, salt and once some soap. Within a week Bekah had a new preoccupation. She worked as a volunteer helping Bea, Innocent’s wife, at the dispensary in town. She was up early to be there before it opened and came back with an assessment of the illnesses in town and the ways in which the dispensary could or could not help. Despite my fears, it was not Bekah who was most disturbed by the changes in Epulu, but rather myself. I was busy all day, with formal meetings, informal discussions, and numerous visitors. It was in the evening, when I was alone with the girls in a solitude framed by the sound of the River and the hyrax calling downstream, that I felt a particular sort of loneliness. I had been through and all around Epulu, greeting and talking with people, and yet there were people whom I should have met, who had once been there, should have still been there, but weren’t. Then, inevitably I thought of John. I found myself counting the days until he came. Each time I came back, several times a year since the first war of 1996, there was always some person that was newly missing. At the start of the war Jean Bosco died and four months later, Basisionoko. It was a period when there was no medical care. We do not even know what caused their deaths. Kavira, who had attended Bekah’s birth, died early in the year 2000. She had had continuous searing headaches. When they were unable to do anything at the little dispensary in town she was sent to Nyankunde. She died there. Life in the Mbuti camp was even more fragile. There had been deaths before the war. The first, long ago, was Tshukiza. He died of mysterious causes the year after we finished our first work in the Ituri. The second, five years later, was Musilianji; she died of an ectopic pregnancy and left no children. A bright light lost in a cruel instant, like a beach bonfire snuffed by a midnight tide. It was complete darkness for days afterwards. Kenge’s mother died a year ago. That had seemed peaceful and correct and quietly folded into the rhythm of camp with eshumba and song. But since the wars, deaths had come more quickly, consistently: Mayipe, the fisherman, lost to some disease; Aasha, drunk at night in town and beaten. Was it by soldiers? Was it by other drunken Mbuti? There were accusations and counter accusations. And now Safenia. The story of Safenia’s death I heard many times. Dudu explained and accused Kenge. Innocent explained shaking his head. He too blamed Kenge. Even Sofi sighed, and said nothing at the mention of Kenge, just sighed again. It was not sorcery; they were blaming him of cruelty. Robert gave me a factual account without opinion, but the most detailed explanation came from Azama. The fights between Kenge and Safenia had become daily. But he did not beat her. He lived from her labor: She cooked his meals, and carried his water, but still he was angry. He did not want to share her meager wages with her own relatives. He wanted more money for kaipo liquor. Safenia scolded him. Then Kenge put her pots and kilako (sleeping mat) outside of the house. “Go,” he told her, “go. And may you die with your kilako and pots.” She left. She took her small possessions and went to the field of a Bila family where she had often helped in the garden. The very day she moved, she died. The husband, cutting a tree, miscalculated. Safenia ran to push the man’s wife to safety and was, herself, crushed. Kenge was blamed not of spouse abuse, not of sorcery, but of having placed a powerful curse; he was shunned. Sorcery is secretive – this was open anger. Although his blood relatives made a protective circle around Kenge, the village moved away. Safenia was buried near Musilianji. The days after Musilianji’s death, I went through the trees to her gravesite with, Jojo , four months old in a mazembe, in my arms. Life seemed cruel and unfair then. Being alone by the heaped soil had been soothing, had been as close to a direct and peaceful goodbye as we could get. A few days after he arrived, John and I were on the trail to Lenda, one of the two research camps. It felt right to be walking together again. It had rained the night before, but there was no rain now. Mid-afternoon, the forest was loud with insects and birds. In the first hour of hiking we had walked under two large mixed troops of monkeys. The mangabey’s hooted at our presence, but most never stopped foraging, and there was no general scramble to disappear. “It doesn’t seem they have learned to be quiet. Do the soldiers hunt them? ” John asked Albert , a Budu field assistant who was accompanying us. He was a nephew of Basisionoko’s wife and, before his death, had often been at Basisionoko’s house in the afternoons. The path was familiar: from secondary forest, to mixed forest, across the Eboyo stream and then mbau forest. Colobus had been ripping open mbau pods to eat the unripe seeds. The pods were scattered over the forest floor. Their light brown interior seemed fresh against the dark leaf litter, transitory as the white of exposed apple flesh. Duiker tracks crossed mud patches where they had fed on the fallen unripe seeds. Had these small antelope populations been reduced? Paulin and Dino during a meeting in Epulu had said yes, that the Mbuti needed to move farther and farther into the forest to hunt. Our path crossed the Sambo stream and climbed the highest hill before the Uamisi stream. John explained what he had learned about elephants in Gabon and Cameroon. We fell easily back into the discussion started four evenings before when John first arrived in Epulu. We had known which day John would be on the TwinOtter plane into Beni. There was only one official passenger airline that entered the eastern Democratic Republic of Congo (DRC), and it owned only one small two-prop plane. It flew from Uganda to Beni once a week. Not until the following day, however, did John arrive in Epulu and then it was well after dark. We heard the motorbike when it accelerated past Kenge’s camp. I could hear Abeli, distantly, shout a greeting. The “moto” headlight lit the lower branches of the mbau along palais path and then appeared around the corner sending a corridor of light clear across the clearing and a gleam off the river. John swung off the back of the moto, stiff, muddy and exuberant. We were already outside waiting for him. Jojo ran up for a full tackle hug heedless of the mud. Knowing that he would arrive that day we had a chicken killed and cooked and the zamu had hot water on the fire for his bath. Once clean and still eating, John started asking questions. How was Epulu? How were Bekah’s friends? We answered with our own questions. Bekah whisked away the plate and scraped the bones together for the cat outside. 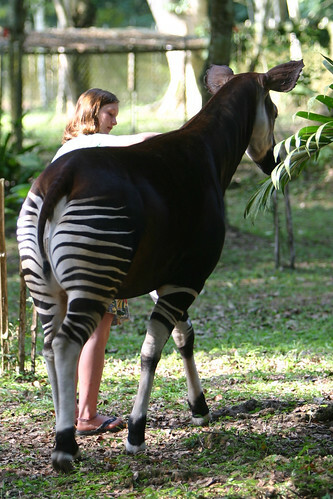 John leaned back, feet up on the low table that had an okapi carved into it. No one had dared to steal that table during the first rebellion. How often, for many years this had been our after dinner ritual. John heard Bekah’s somewhat laconic description of the dispensary and Jojo’s enthusiastic description of her friends’ cleverness. Then Bekah gathered up some books she had brought along to study, took the small lantern and, giving John one last welcoming kiss, moved to the old school house where she now slept. Jojo, smelling of toothpaste and soap, sat cuddled next to John a few more minutes and then climbed under her mosquito net. For the next hour, while the lights were low, while the Epulu River, not yet at high mark, whiffled repetitively in the background, and while the insect chorale held a constant tempo, John and I exchanged the news of the last month. He shared the politics and challenges of the elephant project in Gabon, Cameroon, and Congo-Brazzaville. I explained what I’d learned of the Reserve, what the field teams had been able to accomplish and what the numerous gangs of the anarchy were steadily consuming. 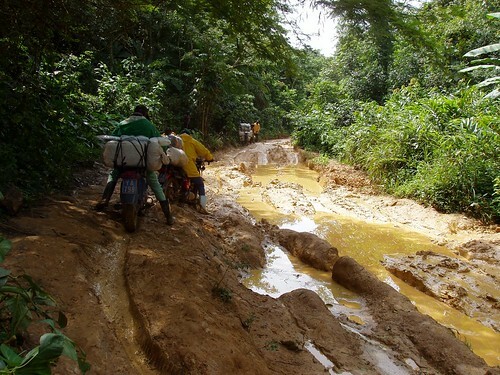 It was then that we decided to go out to the coltan mines near the Lenda camp. There were over fifty mines in the Reserve, a few older ones were gold mines but all the new ones, in many new areas were for coltan or Colombo-tantalite, a shiny black ore from which niobium and tantalum are extracted. These elements of high atomic weight are apparently resistant to corrosion by most acids. As the computer industry and mobile phone industry booms overseas, the local demand soars and the price climbs. All of the mines are illegal, but the current administrators sell false permits and pocket “service fees”. The warden suspects that elephant poachers use the mining camps as a base of operations. We crossed the last stream, the Lenda stream. We pounded a pole against the large flat buttress of a tembu tree to announce our arrival. “Kuya! Kuya!” A chorus of mixed Bila and Swahili welcomes and traditional taunts, came down the path from camp. When we arrived Kole, Asani, and Ekindiye all ducked out of the barazza to greet us. Beans and rice were ready, along with a little pot of honey. And there were buckets of hot water for baths. That night, sitting by the fire, it was easy to feel that nothing had changed. John was by my side. Our feet were warm and lit by the flames. The backs of our woven palm-liana chairs were at a comfortable sixty-degree angle with the dirt floor of the barazza. Our heads were in the shadow, clear of the smoke and cool. An owl hooted in the south, a hyrax screamed in one direction, another answered from the opposite direction. There was a broken wail that John told me was the galago. We knew that somewhere not too far away, and scattered through the reserve, there were other camps, all busier than our quiet one. The clamor of hundreds of miners, the conflicting blare of their radios, and the cacophony of unresolved disputes were muffled by surrounding trees and backed by the same night sounds we listened to at Lenda. The next morning the illusion that this trip to Lenda camp was like pre-war trips vanished. We were not overseeing long-term research or helping visitiors get research projects underway. Now, we followed Kole and Asani south-west. The nearest coltan camp was seven kilometers from the edge of our study area and it was likely that the mining, itself, would continue to creep closer. The actual mining sites, or chantiers, were mobile. Miners panned through the alluvial gravel at one point in a stream-bed and within weeks were searching upstream and downstream for another strike. Kole said that they were now working the downriver bed of the Lenda stream. Kole kept up a steady chatter. He had been on Paulin’s recent elephant census that had turned back because of constant gunfire. “We did not have anything but the machetes and mundus we use to cut trail” Kole said. “Who were the poachers?” John asked. Kole did not know. We stopped at several edos or elephant wallows. John wanted to see if they were still active. At least one had been used within the last few days by a small group of elephants. We saw where they had dug into the bank of a hill with their tusks. Kole and Asani detoured to show us where an elephant had been killed the year before. Just bones were left now. “Papa Kenge says the poachers are sleeping with the Epulu girls in the coltan camps,” Kole said laughing, “He tells the ‘little sisters’ of Dudu that it is their fault the poachers are ruining the forest. If they weren’t always flaunting their bodies so cheaply the poachers would get bored and leave.” Asani and Kole laughed. Kenge had always been able to make people laugh, and obviously still could. “How will Kenge get on without Mama Safenia to care for him?” I asked Kole. He spoke lightly, disregarding entirely the dark accusations that circulated about Kenge. “But Papa is sad without Hati ya Mama,” Kole used the respectful term for the deceased. “She kept him company,” he stated factually. Kole paused and then added, “She was a good woman and Kenge knows that.” It was as though he wanted to make sure I understood. He talked lightly, affectionately of his father. If Safenia had been Kole’s real mother she would almost certainly still be alive. If Safenia had children of her own, she would have sought refuge in their homes and they would have intervened on her behalf with their father, Kenge. Kole and Atoka had always appreciated Safenia but would never take her side in an argument against their father. John noted how the forest changed. We had left the mbau. We were in mixed forest with abundant large tembu and eko trees. We had been breaking trail, but after about an hour and a half we joined a much-used path. “This is one of the main paths to Bomalibala,” Asani followed the trail south. The camp’s name meant ‘broken marriage’. 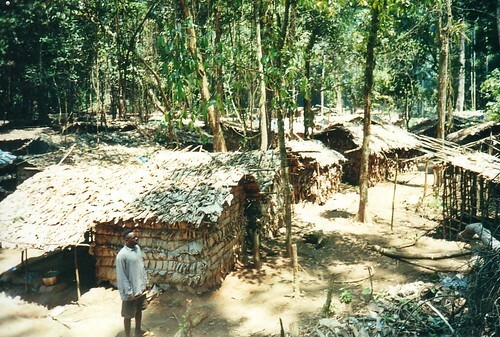 Mining camp in the Ituri Forest. We split up as we approached. John and Kole went around the back of some barracks-like structures on the left. I walked in towards the right where the women were singing. Asani stepped out in full view, next to a man slashing together his tiny stall-like sleeping quarters. The man stopped his work and sat motionless. A silence spread across the camp like falling dominoes until they all lay flat. There was no doubt that everyone in camp knew the mining was illegal within the Reserve. I had hoped to see the women singing and dancing. They had their backs to me. But aware of the frozen activities and suspended conversations, they too stopped and several turned slowly to face me. The camp itself seemed diminutive beneath the tall trees. No one had taken the time to clear a safe opening. Any number of trees, if they fell, would obliterate a quarter or half of the barracks, demolishing them like a foot on a soft, new termite tunnel. “So, keep on dancing. Why have you stopped?” I asked the women. I saw the piles of second hand clothes on the ground in front of them. They had come to sell those and there were also open bags of salt and sugar. The women were young girls really. There were five all under twenty-five, and I recognized one that had sometimes come down to play with Sarah. I could not remember her name, but I knew which house had been her mother’s, a Mungwana who lived along the road. Another was half-sister to Dudu. One girl shrugged her shoulders, another laughed. They took up the jingle again. But they had barely sung two phrases when a young man strode up. “Muache. Stop,” he shouted. Turning his back immediately on me and on the girls, he strode to the far end of the camp, past John and Kole, without acknowledging any of us. The singing stopped. A lone radio at the far end of camp was shut off. No one came forward to greet us. We moved from person to person down the thatched “long” house whose walls were cut branches. No one refused to shake hands, but no one came forward. The leaves on the central part of the camp houses were all dried, but on the far ends, where it continued to expand, the leaves were still green. It was a growing camp with a look of haste and impermanence. “Where are the men,” John asked, as it was obvious that most of the few men left in camp were entrepreneurs come to sell and buy, not miners. No one offered an answer. I noticed the “first aid center” was a cell in one of the “barracks” with just two plastic bottles of medicine, one of chloroquine for malaria-like symptoms and one of tetracycline for everything else. The pills were displayed on a stool in front. The “nurse” was a lad we knew from Epulu. He was the son of one of the Reserve’s guards and had not studied beyond the third grade. As we were circulating around camp, the camp’s own security forces, three of them, materialized. They were armed with symbols of guns rather than real guns. One was a boy who six years earlier used to fish on the Epulu below our house. He was Sarah’s age. Their heavy arms were manufactured in the same way as the arms that Jojo carried around Epulu: ndolo and raffia. We held out our hands to them as well and, although only one refused to shake hands, they remained graven faced and probably somewhat uncertain as to how they should act with such visitors. One of Dudu’s sisters, Ndete, was sitting on a low stool by a flat bowl of coltan. The small pebbles were black and shiny. I picked a few up. They were heavy. “You will buy more when the men come back tonight?” John asked. It was a rhetorical question. She smiled stiffly, but did not answer. We wanted to see the mining operations themselves, but needed a guide. It was obvious that the camp “guards” would not take us. Finally, with a combination of teasing and argument, we convinced a young man to accompany us. He was in camp because his friend and mining partner was ill, a dejected looking fellow slumped on a stool. As we followed a trail leading past many turnoffs our guide told us that he had finished secondary school. He told us he really wanted to go to university but there was no money for tuition and he had to support his little brothers and sisters. It took nearly fifteen minutes at a brisk pace to get to the streambed that was currently being dug out. It was just one of four associated with Bomalibala. As in the mining camp, our arrival was greeted by expanding silence as knowledge of our presence spread from one team of miners to another. There were six teams in all at this opening, each made up of two or three men. Each team had constructed one short sluice from the cambium and bark of a tree. One man shoveled gravel onto the sluice and another poured bucketsful of water that carried all the light particles back to the muck. I had to concentrate on where I put my feet. There were mounds of alluvial mud, some of it firm but much of it a quagmire. Our guide announced our visit in a combination of Swahili and Lingala. The men were spattered with the light brown/gray mud from head to foot with their legs buried deep in mire. To change position they had to pull out first one leg and reposition it then the pull out the other. I moved slowly, careful to avoid an ignominious fall. Miners, in the meantime, came forward to greet John and exchange jokes with Asani and Kole. I realized that their main fear had been that we would make off with the small findings of the day. As soon as it was clear that we were not “tax collecting” they relaxed. Although they had transformed the streambed so thoroughly that I could not even find its course, only a handful of large trees had been felled. The openings resembled an elephant edo, the earth all turned over and raw, but with untouched forest just to the side. One group of three boys had no sluice. They were scooping up samples. They cheerfully informed us that they were looking for a strike. When they found a place they would “buy” rights to it. Some of that money would make it back to Chief Roger Matongo, the groupement chief and some of it to Mama Bakebi, who was the chief of the localité, a smaller political division. As we left the clearing John and I discussed what this must mean for Mama Bakebi: “her” forest was bringing her an income that actually included tithes from people immigrating in from as far away as Butembo, Biakatwe, and Mangina. She must consider it deserved good fortune amidst the current social confusion. There was another camp, Niania, we could pass on the way back towards the road. Asani knew the way. We thanked the young fellow who had guided us to the mines. He seemed almost reluctant to have us leave. As we shook hands, he told us again that this was only temporary: as soon as he had some money he would go back to school, go to the university. “Courage,” we told him, thinking that he was rather too slight for the physical toil of mining. Both John and I were quiet for the next few kilometers. I suppose we both felt dispirited for the same reason. As our guide had become more and more cheerful and helpful, the hopelessness of his situation became clearer. What universities were left in Congo worth going to even if he had money? And how many miners left the camps with any more than they went in with? It was just a way of life, a way of biding time and keeping hope alive. It became clear an hour later as we veered south that “Niania” was not really back towards town. We continued trooping along, tired and also frustrated. What benefit did this exploitation have for anyone — certainly no benefit for the forest. What were the alternatives? We came to where the path split. “That way towards Niania,” Asani tilted his head north, and then lifted his chin towards the south, “that way they are mining.” We hesitated. Perhaps we had seen enough of the excavations. Perhaps we should just go north through the mining camp, on to the road and back home. Then someone, with a strong stride came up the path from the south. John broke into a grin as he recognized the man coming round a bend in the path. It was Jeu who lived on the palais path across from Azama. Jeu was a fisherman from the Lokele river tribe near Kisangani. He always had a joke to sweeten his high fish price, determined not by going rate but rather by what he needed. Jeu had been one of the principal brick-layers when, eight years ago, we built the research center across the river from the Reserve’s administrative buildings. Well before that, the two of them, John and Jeu, had dived together for the corpse of Kasea. More importantly, John had once delivered Jeu’s sister’s baby when, very pregnant, she had taken caught a ride on our old landcruiser to Kisangani. She had been visiting Jeu. John was going for money and supplies and of course carried at least 6 passengers. Then, stuck behind a truck and everybody waiting, Jeu’s sister had gone into labor. The other passengers had moved back, but John got water, washed up, and helped her through. The baby was a boy and named John, of course. John met Jeu mid path. “Oh la la,” Jeu put down the firewood that he had balanced on his shoulder and slapped John’s hand for a vigorous and long hand shake. He tossed his firewood by path and turned back south, throwing a grin over his shoulder. He was a handsome man, at least forty, but broad shouldered, tightly strung, and with a lively always bemused expression. Dried mud clung to his legs above the knees and was spattered up his arms. After more than a quarter of an hour, we came to a small worked over opening similar to the one we just visited. Jeu strode to the top of a discarded gravel mound. John kept up his loud conversation with Jeu. Mining operations slowed; people stopped to listen, chuckle, and offer observations. “I want you to meet this noble fellow, Kasereka Mulengera, he is the PDG of this operation.” Jeu swung his arms towards a small ragged man with a pick and shovel. “Kasereka” was a Nande name, the same ethnic group as Kavira and Maseka. John grasped the muscular and muddy hand thrust towards him. Kasereka appeared to have only two teeth left in his mouth, although perhaps there were some molars in back. “Why did you come all the way from Kivu to be PDG up here,” John asked. PDG means président-délégué-général, a term reserved for high government posts. Speech somewhat slurred by the holes in his mouth, Kasereka explained that he had been mining in the Ituri for ten years, gold first and now coltan. It was obvious that he was one of the older men in the clearing. Kasereka’s two “team mates” came forward to shake hands with John. I waved from the top of a hill of re-worked alluvium. The other teams had mainly set aside their pails and shovels to listen as John launched onto a description of coltan buyers he had met in Kivu. Many left their sluices to come lean on their shovels where they could hear better. I remembered John’s casual reference to German coltan buyers, it must have been a year ago. He had flown out with them on the small plane to Kampala. Now the story was much more elaborate with reference to their whiskered appearance, their bulging carry-on luggage, and reference to the rich coltan mines of Kivu. John’s banter was peppered with plenty of questions: “Why did you come here? What were you doing, and where, before you came?” The answers, although varied, mainly came down to a single assessment of the present, “We just want to find the means to eat and feed our families, send our kids to school.” “And I sure am hungry now,” one boy volunteered as he ambled over. “Well, would cigarettes, help?” John asked. Tobacco was locally said to hold hunger in abeyance. “You have some cigarettes don’t you, Jeu?”. “I sell them for ten francs each,” Jeu grinned. Although rested by the hour passed at Niania, the three-hour walk out seemed long. We strung out along the path. I could just see Asani up ahead when the path lay straight. Off and on I could hear John talking with Kole behind. My thoughts again turned to Safenia. I wanted to go see her grave before it was given back to the forest. Now it was a mound of earth but eventually it would be raked down and leaf duff scattered over it. The living weren’t yet ready to relinquish Safenia, but eventually she would be allowed to join the dead, the past, the baketi. From death to baketi, a litany ran like a question through my head : Safenia, Safelani, Aasha, Musilanji, Maipe, MamaKenge. My feet stepped rhythmically over the eko leaves, the mbau leaves, the small streams and I climbed over logs. The litany continued as we walked in unison up the path towards town: Kalume, Basisionoko, Kavira, Bosco. Each name came with a memory; each memory brought a series of memories. By the time we reached the edge of the forest, the fields of planted rice and plantains, the sun was low and golden. Looking forward – Jojo with okapi at the station in 2006. It was dark when we reached palais. The litany of names accompanied me past what had been the homes of Bosco, of Basisionoko, of Kalume, the camp of Musilianje, Aasha and Safenia. Our girls were waiting for us. We ate sombe and rice listening to the girls’ stories from the last two days. Stories from the dispensary and from camp. Quite independent now, Jojo got ready for bed, then curled by a lantern for a last chapter of her book. Bekah joked with her as she prepared another lantern with which to study. I gathered the dishes and carried them out to the kitchen. Again as I stepped into the darkness, leaving the lantern-light and laughter behind, I heard the litany of names. It seemed to be called from a distance, quietly. The hyrax was closer and the chorus of night insects loud over the incessant rush of the river. I stopped on the way back to listen to the river. John came out and stood next to me. He commented that Jojo, with her new enthusiasm for reading, had discovered the old books that Sarah and Bekah had read. We would have to take some of them back to the States. I agreed, and then we stood quietly. John went back and brought out two stools for us. “Just wait,” he said. He returned inside to rummage through his duffel bag and brought out two small bottles of wine. Airplane wine. “Puis je vous offrir…,” he offered with a formal bow. “Mais oui,” I answered. John pulled his stool close, so I could lean against his warmth. In front of us, the sound of the Epulu River that would stay through this new millennium and beyond. But so much would not last. “May something good grow out of this war.” That was our toast, and a belief that within the repeated scorching is a constant simmering potential. Something of great interest can be born. We do not know what it will be, but it too will be defined and understood by what went before. This entry was written by Terese Hart, posted on 2014-09-23 at 10:07 pm, filed under Ituri Story_memoire. Bookmark the permalink. Follow any comments here with the RSS feed for this post. Post a comment or leave a trackback: Trackback URL.